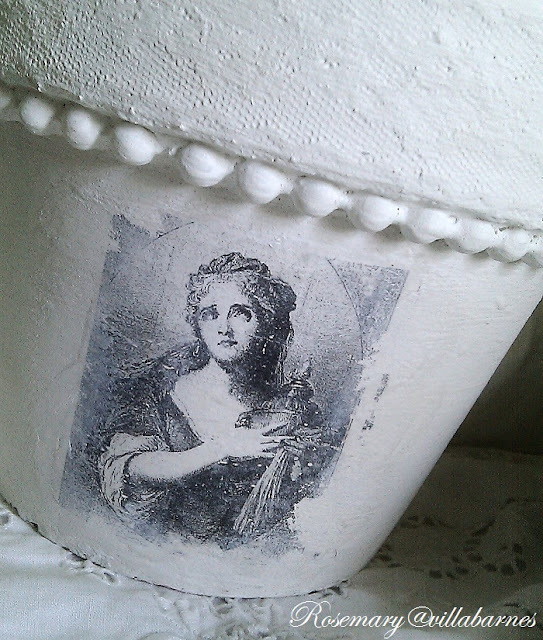 This flower pot got gesso, lace, beads, and a transfer. I decoupaged lace, glued beads, slathered it with gesso, and transferred with gel medium. It works really well for storing cards and tags. I'm getting ready for my show at Kane County this weekend. Gotta get back to work. That looks great! I really like the beads on it--gives so much texture. love those great textures and wonderful graphic! I love how the beads look like they were there the whole time, Rosemary! Great image, too. These pots do make good storage containers. 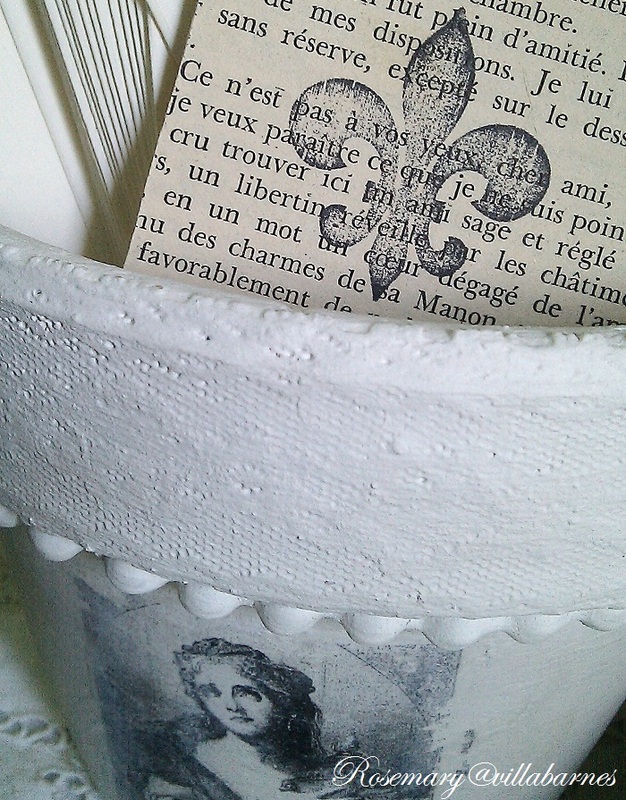 :D This is so lovely....it would be perfect for holding charcoal pencils in my art studio! Rosemary, you done went and did it again! Created something very beautiful! Your pot is gorgeous as is everything you create! I love these pots, so creative. Your work is so inspiring. Your photos are just perfect too! Thanks for sharing. Gorgeous!!! Love the graphic you used...beautiful job! i just love that clever use of the beads, rosemary!! Love this! I know these are going to go fast! Best wishes this weekend! I love the beaded look on the pot....Have fun at the show and don't work too hard!!! You worked your magic once again ... I'm definitely inspired! Very sweet pot Rosemary, I love the pretty image. It is so pretty. I am going to have to try a transfer. Rosemary or should I call you Picasso! Another fabulous restyle I just love how you transform everyday things into something wonderful. Beautiful! You are one talented gal. My best to you this weekend, I am not doing Kane this weekend... last month kind of took the wind out of me. So pretty. It's amazing how you can take such a simple piece like a flowerpot and turn it into a piece of art. You are sooo talented. Thank you for sharing your project at Potpourri Friday! 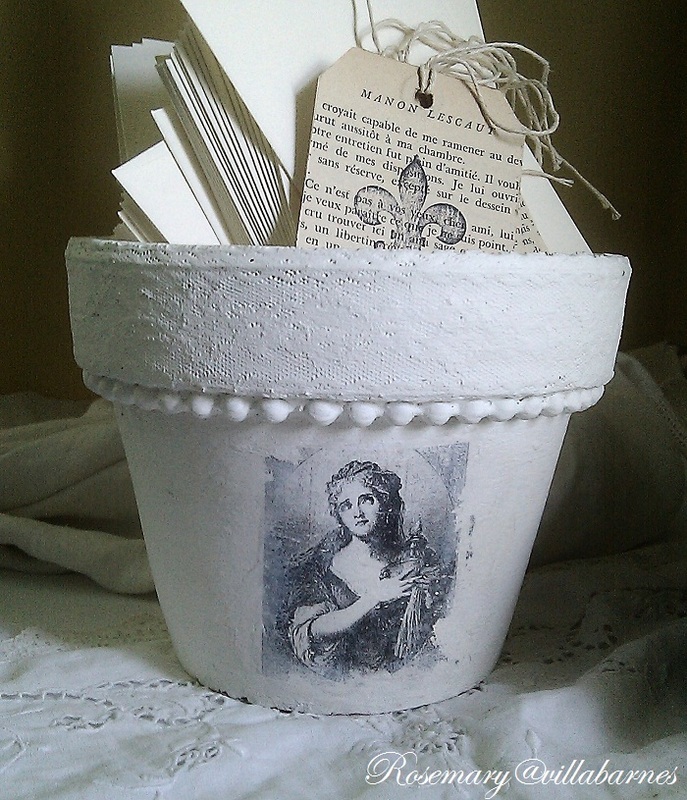 Oh my..this is a beautiful pot..I love the look of the lace covered like that. You sure have talent! Rosemary--Just letting you know I'm including this project (with a link back) in my Re: blogpost tomorrow. Re: features earth-friendly tips and projects. This week's topic is repurposing pots. I loved this one you did and have had it pinned since you first posted it.